Corporate Governance｜Takisawa Machine Tool Co., Ltd. This basic policy establishes the basic policy with regard to corporate governance for the sake of continuous growth of Takisawa Machine Tool Co., Ltd. (hereinafter referred to as "our company") and medium- and long-term improvement of the corporate value. To contribute realization of social and environmental sustainability, to enrich the life of people all over the world, and to realize permanent growth and stable profits through manufacture and sale of machine tools, our company shall work on enhancement of corporate governance in accordance with the following basic views. Our company shall ensure substantial equality for shareholders and work on immediate information disclosure and environmental maintenance for securing and exercising the shareholder's rights. Our company shall recognize that cooperation with all stakeholders including the shareholders is essential for continuous growth and medium- and long-term improvement of the corporate value, and make efforts to create a corporate culture respecting the rights and position of the stakeholders and the wholesome business activity ethics. From the viewpoint that appropriate information disclosure will ensure transparency and fairness in management and realize corporate governance, our company shall actively disclose the information considered to be necessary for the stakeholders (including non-financial information) in addition to disclosure based on laws and regulations. Our company shall establish a supervising system highly effective for the directors by separating the management decision making/supervising system and the business execution system to create an efficient management/execution system and by designating outside directors. Our company shall actively communicate with the shareholders and reflect the opinions and demands to the management appropriately for continuous growth and medium- and long-term improvement of the corporate value. The board of directors shall be composed of executive directors and outside directors having specialized knowledge and experience in each field in consideration of the balance of their knowledge, experience, and capability. The appropriate number shall be 11 or less for the directors except for the directors who are the audit and supervisory committee member and 5 or less for the directors who are the audit and supervisory committee member as designated in the articles of incorporation. The board of directors shall make decisions related to important matters such as management strategy and management plan, and supervise business execution by the directors. The board of directors shall transfer the authority to execute and decide business other than the important matters prescribed in the laws and regulations, articles of incorporation, and rules governing the board of directors, and establish a system to receive the reports of execution state of the business in charge and the progress of the management challenges from the executive directors. The outside directors shall appropriately reflect the intention of the stakeholders, and supervise the management and conflict of interest in order to improve the corporate value in the medium- and long-term from an independent standpoint. The board of directors shall determine the annual schedule, provide information beforehand to secure enough deliberation time, and establish the system to ensure the effectiveness of the decision making and supervision functions by the board of directors. Candidates for the directors shall have experience, knowledge, and specialty appropriate as the directors according to the management philosophy and management strategy of our company. Candidates for the outside directors shall satisfy the independence standard of our company, have no risk of having conflicts of interest with ordinary shareholders, and have high specialty and rich management experience. The board of directors shall determine the remuneration (basic remuneration and bonus) collectively considering the duty, company's performance, management status, and so on for the directors except for the directors who are the audit and supervisory committee member. For the directors who are the audit and supervisory committee member, it shall be determined by discussion of the audit and supervisory committee. Our company shall provide the opportunity necessary to obtain the knowledge of business, finance, organization, and so on necessary for the directors to play the roles and perform the responsibilities, and continuously conduct training on law revision and management challenges. The outside directors shall obtain information from the related departments at any time to deeply understand the management philosophy, management policy, business activity, organization, and so on of our company group. The audit and supervisory committee shall audit and supervise execution of duty by the directors and so on to operate the business legally, appropriately, and efficiently. The audit and supervisory committee shall have full-time audit and supervisory committee member to ensure effectiveness, and shall strive to grasp and monitor the management execution status appropriately and accurately. The nomination/remuneration advisory committee shall deliberate proposed director and employee executive officer candidates, and report the suitability to the board of directors. The nomination/remuneration advisory committee shall deliberate the remuneration level and index of the directors and employee executive officer except for the directors who are the audit and supervisory committee member, and report the validity to the board of directors. Our company shall actively disclose the basic policy including the management philosophy, management strategy, and management plan to ensure transparency and fairness in decision making of the company and realize substantial corporate governance. We shall strive to make disclosed information plain and specific. Our company shall strive to set the date, place, and so on of the shareholders meeting appropriately so that more shareholders can attend it. Our company shall establish a system to allow not only the shareholders attending the shareholders meeting but also all the shareholders to exercise their votes appropriately. Our company shall strive to send the convocation notice at an early stage and to disclose it promptly so that the shareholders can secure a sufficient period for discussion. Our company shall designate the director in charge of the management department as the officer in charge of IR, and the president and the officer in charge of IR shall actively communicate with the shareholders and investors in a constructive manner for the sake of continuous growth and medium- and long-term improvement of the corporate value. The officer in charge of IR shall manage the departments engaged in the IR activity, and the departments shall cooperate with each other and strive to communicate with the shareholders. Our company shall obtain and hold the shares of the business partners when it is determined that it will contribute to medium- and long-term improvement of the corporate value from the viewpoint of establishing stable and long term business relationships with the business partners and facilitating and enhancing business strategies such as business partnership. Our company shall determine whether or not to exercise the votes related to the strategic shareholdings based on that it will lead to improvement of the corporate value of our company or it will not depreciate the shareholders. When conducting transactions with the related party, our company shall exclude the concerned officers from the quorum of such resolution as the special interested persons, and obtain the approval in the board of directors. This basic policy shall come into force on June 23, 2017. Revision and abolition of this basic policy are conducted according to a resolution of the board of directors. Our company believes that to get confidence from customers and society and continue to be a company to be selected, we must recognize compliance not only just legally but also as the one including the corporate ethics, social ethics, and social norms in order to promote fair business activities. Therefore, our company establishes the "Company Code of Conduct" and "Employee Code of Conduct" as described below, and the officers and employees shall conform to them in their activities for the company or themselves. We shall recognize the social responsibility and mission of our company and work on establishment of reliability. Machine tools are mother machines to machine the main body and parts of various machines including automobile parts. Therefore, they have an extremely important aspect to determine the quality of final products, which depends on the superiority of their mechanical performance. As shown in our quality policy of "Development of products relied on by customers", reliability serves as the foundation to make our company exist and to fulfill its mission. We shall conform to the laws, regulations, and rules, and perform fair and faithful business activities. We shall not only conform to the laws, regulations, and rules but also strictly refrain from seeking profits by unfair measures and performing business activities departing from the social norms. We shall resolutely fight against anti-social forces threatening social order and security and inhibiting development of wholesome economy and society. We shall strictly refrain from important prohibited matters including false financial reporting which may cause a defect in the internal control system. We shall provide socially safe and useful products and service. We shall grasp social needs accurately, and provide socially safe and useful products and service pursuing quality and cost accepted by customers. We shall develop imaginative human resources and corporate culture with a positive atmosphere in order to provide new products. We shall ensure transparent management and develop a good relationship with the local society and international society. We shall disclose information appropriately as necessary and communicate not only with the shareholders and creditors but also widely with the society. The relationship with the local society is also one of the most important relationships for our company. Therefore, we shall recognize it as the foundation of the existence of our company and contribute to development of the local society through the business activities. In addition, when conducting business activities overseas, we shall conform to the international rules and local laws and respect the local cultures and customs. We shall respect the human rights and individuality of the employees. We shall not only respect the human rights and individuality of the employees and give consideration to ensure their fair treatment but also exclude the actions of ignoring human rights such as sexual harassment and power harassment, and work on creation of a wholesome work environment. We shall strengthen actions to the environmental problems as a common challenge for human beings. We shall work on proper disposal of industrial waste as well as enhancement of energy saving in our plants and offices. As the basic action standard with regard to the business activities and interpersonal relationships, the employees shall respect the diversity including their respective individuality, personality, gender, age, philosophy, and physical condition, and have an attitude of handling the life and personality of all people including people outside the company equivalently to those of themselves. In all business activities, we shall conform to laws and regulations including the Constitution, Companies Act, Financial Instruments and Exchange Act, Labor Standards Act, and Industrial Safety and Health Act and rules including the work rules of our company, and perform business fairly and faithfully. We shall provide excellent products and service in our business activities to finally contribute to the life of people, and above all, to ensure safety. We shall ensure fair business activities and disclose information actively from the viewpoints of the local society and customers to achieve more open management. We shall respect for overseas laws and regulations, culture, and so on by complying with the International Financial Reporting Standards and so on in the international society. Our company shall continue to establish the internal control system and endeavor to ensure the effectiveness in accordance with the following internal control system basic policy based on the provisions of Article 362 paragraph 5 of the Companies Act and Article 100 paragraph 1 and 3 of the Ordinance for Enforcement of the Act and the provisions of Article 24, paragraph 4, item 4 and Article 193, paragraph 2, item 2 of the Financial Instruments and Exchange Act. In order to ensure that execution of duties by the directors conforms to the laws, regulations, and articles of incorporation, we shall establish the "Compliance Basic Rule" to stipulate fair management based on compliance with the laws and regulations, and promote the activities of the compliance committee to ensure compliance. The board of directors shall be held generally once a month and on an as needed basis to allow communication between the directors and mutually supervise their business execution. For business execution, the person in charge and the responsibility and authority of the person shall be designated in the "Official Authority Rule" and the person shall execute the business. In addition, an internal audit office shall be provided to grasp the business operation status and to ensure the appropriateness. Furthermore, we shall establish the "Internal Reporting Rule" and provide an internal reporting office to receive reports with regard to legal violation and so on from the employees. Also, we shall prevent insider trading according to the "Insider Trading Management Rule". The information on execution of duties by directors shall be recorded on a document or electromagnetic medium (hereinafter referred to as "documents") and stored properly according to the "Saved Document Handling Rule". Also, the documents shall be stored properly in a highly retrievable state according to the storage medium. The directors shall be able to view the documents mentioned above as necessary. We shall establish the "Risk Management Basic Rule" for risk management, and not only designate the president as the chief executive of risk management but also establish a risk management committee to manage risks effectively and efficiently. The contents of the proceedings of the risk management committee shall be reported to the board of directors accordingly. The committees established to manage previous risks shall closely cooperate with the risk management committee. The board of directors shall determine the management targets, and the officers in charge of the business shall establish the concrete measures to achieve the targets and the efficient achievement method based on segregation of duties and execute the business. We shall make use of the information system and review the targets and business execution status to realize business efficiency. For business execution, the person in charge and the responsibility and authority of the person shall be designated in the "Official Authority Rule". In addition, the internal audit office shall audit whether the business is executed according to the rules and continuously check the effectiveness the internal control system. To ensure that execution of duties by the employees conforms to the laws, regulations, and articles of incorporation, we shall establish the "Compliance Basic Rule" to stipulate fair management based on compliance with the laws and regulations, and promote the activities of the compliance committee to ensure compliance. For business execution, the person in charge and the responsibility and authority of the person shall be designated in the "Official Authority Rule" and the person shall execute the business. In addition, an internal audit office shall be provided to grasp the business operation status and to ensure the appropriateness. In addition, we shall establish the "Internal Reporting Rule" and provide an internal reporting office to receive reports with regard to legal violation and so on from the employees. Also, we shall prevent insider trading according to the "Insider Trading Management Rule". Our company shall aim to further develop the whole group by determining the "Group Management Policy", making the significance of the existence and the vision of the group clear, and deepening the togetherness and the trusting relationship between the companies in the group. Also, our company shall determine the management policy and management organization for the subsidiaries based on the "Affiliated Company Management Rule" to establish the system to ensure business adequateness. Our company shall receive the management status and so on from the subsidiaries periodically or as necessary based on the "Affiliated Company Management Rule". Our company shall establish the "Risk Management Basic Rule" and hold the risk management committee periodically to grasp significant risks in the subsidiaries and handle them appropriately. In addition, if a risk having serious influence on the management of the subsidiaries may occur, our company shall receive the report from the subsidiaries and cooperate with the subsidiaries to take prompt and appropriate measures. Our company shall request the submission of necessary documents based on the "Affiliated Company Management Rule" and verify the execution status of the duties by the directors to grasp the business contents of the subsidiaries accurately. Important matters shall be deliberated at the board of directors of our company. Our company shall hold the compliance committee periodically based on the "Compliance Basic Rule" and verify the efforts to compliance by the subsidiaries to establish the compliance system of the whole group. The duties of the audit and supervisory committee shall be supported by the internal audit office. The rights to supervise and direct the internal audit office shall belong to the audit and supervisory committee within the range of supporting the business operation. When determining staff reassignment, performance appraisal, and penalty for the employees, etc. of the internal audit office, the consent of the audit and supervisory committee shall be required in advance. The directors in charge of business and employees, etc. of our company shall report the statuses of management, finance, and so on to the audit and supervisory committee periodically based on the "Internal Control Rule", and if an important matter occurs, they shall provide any necessary report and information without delay. Also, the directors and employees of the subsidiaries shall report the matters specified in the "Affiliated Company Management Rule" to the department in charge of management of our company, and the department in charge shall report the contents to the audit and supervisory committee promptly. Our company shall stipulate prohibition of treating the whistleblower adversely for the reason of the whistleblowing and protect the whistleblower based on the "Internal Control Rule". Our company shall determine the budget necessary to execute the duties of the audit and supervisory committee in advance based on consultation with the audit and supervisory committee. The directors in charge of business and employees shall cooperate to develop the auditing environment so that the activities of the audit and supervisory committee necessary for audit by the audit and supervisory committee, such as viewing of important documents, actual inspection, discussion with the directors in charge of business and employees, audit of subsidiaries, and cooperation with the company auditors of the subsidiaries, are performed smoothly. To ensure internal control relating to reliability of the financial reporting based on the Financial Instruments and Exchange Act and the standard issued by the Financial Services Agency, the internal control development committee shall be established, and development and management of the internal control shall be performed continuously based on the "Internal Control Development Rule Relating to Financial Reporting". Our company and the group companies of our company shall take a tough stance against, ban on any relations with, and refuse unreasonable demands from the antisocial forces threatening order and safety of civil society and inhibiting wholesome development of companies based on the Organized Crime Exclusion Ordinances. We shall establish the "Antisocial Force Handling Basic Rule" and make efforts to thoroughly inform it internally and to maintain and improve the viable system development. We appropriately grasp the risks that impede our business and take appropriate measures to deal with those risks in an effort to realize smooth and sound management activities. We have established a risk management committee with the company president as the chief executive officer, and have also appointed persons who are charge of and responsible for risk management as well as persons who conduct risk management for the individual departments. In addition, we have established various committees for individual risk management etc. who work closely with the risk management committee to deal with any risks. During execution of the preceding paragraph, the risk management committee promptly takes corrective measures to remove any problems when finding issues which hinder work performance. 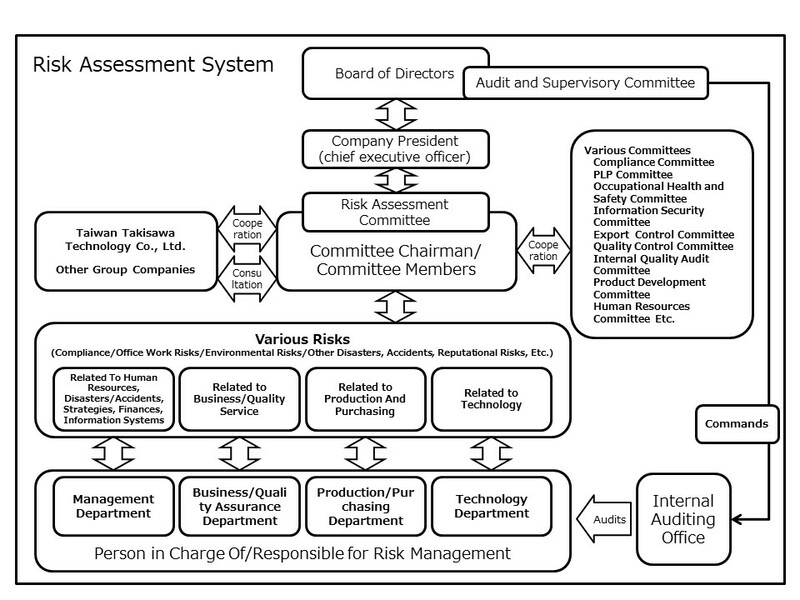 During the execution of their duties set forth in paragraph 1 above, the risk management committee, in case of risks resulting from fraud, not only simply evaluates and responds to the superficial facts related to the fraud, but also evaluates the risk based on the motives, causes, and backgrounds which lead to the fraud and responds accordingly. In order to preemptively prevent accidents such as loss, destruction, falsification and leakage of information by implementing appropriate information security, we provide information security education to our employees from the time of entry into our company. In addition, in order to check the management status, we regularly conduct inspections at the workplace and strive to prevent any leaking of confidential information. Furthermore, when providing access to our servers, we are making efforts to ensure that access rights correspond to the clearance level of the respective individual. Also, we have introduced a mechanism to prevent and monitor unauthorized external access and infection with computer viruses. "Development of products relied on by customers"
Obtain absolute reliability by continuous improvement of QMS effectiveness.